How to Travel to India! Have you decided to travel to India? India is an amazing country with sights, sounds, and fantastic cultural celebrations, unlike those found anywhere else in the world! That being said, a successful and enjoyable travel experience to India, and truly making the most of your time during your travels requires some knowledge and effective planning. In order to travel there, you will need to book air travel. Unless you already live in or around the South-Asian country, you will be flying there. Two commonly flown airlines that will get you to and from India are Air India and Singapore Air, but there are other good ones too. An important factor to keep in mind is that air travel to India from the United States takes approximately 20 hours, depending on your layover time and which airport you will land at in India. Your flight will likely leave the United States from an airport in a bigger city, like New York, New York or Los Angeles, California, because these cities have larger airports that offer international flights to far off travel destinations. If you don’t live near a city that offers international travel, your first step will be traveling to one that does. You will probably have to switch planes at least once during your travel to India and possibly airlines too. Be sure to check the weight limits permitted for carry-on bags and free checked bags at each of your booked airlines to avoid surprise fees at the airports. When flying from the United States, you’ll have a layover. Common layover locations when traveling to India are Singapore, Dubai and Japan. Singapore is fun because they promote tourism by offering free bus tours which include a boat ride. They do this to promote their brand new skyline condos, but no one tries to sell you anything and it's a great way to beat the layover blues! On my last trip to India, I stopped in Singapore on the way there and Japan on the way back. Try to have fun at your layovers because they give you a break from flying. Just don’t have so much fun that you miss your connecting flight to India! 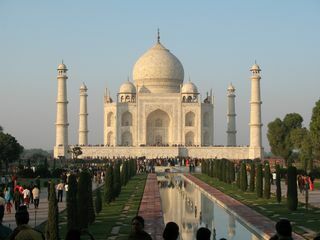 I recommend you go through a professional travel agent to book your travel to India. The air travel and hotel are easy enough to book, but booking travel between cities and states is a bit more complex and you will want reliable travel. India's famous sites are scattered all over the country, so you need ground transportation. When you arrive, and when you're simply traveling around a state, town or city, you can easily hire a rigshaw driver to get you around for a small fee, but for more involved travel, a rigshaw won't do. You will discover that a good travel agent of India can get you great package deals to include air travel to India, the hotel and driver transportation to famous sites. Whatever you do, don't try to drive yourself around India. Understanding the way that people drive, which at first appears to be complete chaos to a western driver, takes years of practice and extreme caution! It’s important to understand the concept of culture shock when traveling to India. First of all, the population of India is enormous, soon to be the largest in the world! No matter where you visit, you will see a lot of people. Second, be prepared to see poverty. Many men, women and children in India live in the streets. For some, seeing real poverty can be shocking, life changing even. I encourage all visitors to understand that more than 80% of India’s population are of Hindu faith or believe in Dharma; this means that most everyone believes that by living virtuously, they will attain a higher level of being in their next life. In other words, even the poor men, women and children of India live happily, so try not to dwell on their poverty; they don’t. Arrive knowing that India is a different place and recognize it for its beautiful people, vibrant culture and exciting history. Be prepared to see a lot of color in India too! You will witness Indian weddings, festivals, colorful clothing, exciting nightlife and even colorful food! Whether, you visit Taj Mahal, attend a wedding or see amazing palaces, visiting India is a wonderful experience you will remember for a life time! Leave how to travel to India to visit popular India tourism destinations.